Among the Arab countries, UAE is the shining drawcard for entrepreneurs. Those eager to stamp their mark in the telecommunication and IT (Information Technology) sectors are experiencing immediate reward. Bolstered by a proactive government striving to build innovation and technological advancement across all industries, and actively reshaping the future face of UAE. Such a promising economic landscape encourages more entrepreneurs to take the first steps toward company formation. In fact, the Startup sector is experiencing growth across a wide range of activities including technology, retail, lifestyle, environment and communications services. Those businesses driving engagement with youth, streamlining company operations or offering innovative lifestyle options are certainly in high demand. It clearly reflects a new kind of hope and opportunity for the government, the private sector, and society at large. The UAE government also has a very clear vision of promoting private business in order to boost growth and employment. The government recognizes the huge potential of entrepreneurship and is continually investing and prioritizing the needs of this sector through initiatives such as partnerships, startup programs and SME funding. 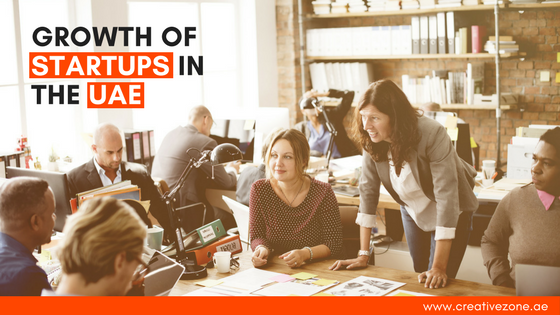 From job creation to infrastructure investment, Startups and SMEs contribute greatly to UAE's economy. The United Arab Emirates, and particularly Dubai, presents a major opportunity for all global businesses keen to reach wider markets. Dubai is a major commercial and economic hub in the Middle East with close proximity and easy access to the various Middle Eastern, West and South Asian, East African and Eastern European markets. A large number of foreign and local entrepreneurs take advantage of the business opportunities in the UAE, and more specifically Dubai. The government’s encouragement of small and medium businesses has established this as preferred destination for local and regional entrepreneurs for business startups and expansion. With over 12,000 successful business setups, CREATIVE ZONE continues to help local and foreign entrepreneurs setup their businesses in different UAE jurisdictions. From UAE Free Zones, Dubai Economic Development (Dubai Mainland) to Offshore company formations. There are a number of licensing options available in the country. To find out which one suits your business requirements, talk to one of our Business Setup Advisors . We have a team of Company Registration experts ready to assist you. Call +9714 567 7333 or live chat with us today.